Save Innsmouth benefits heavily from listening to and acting on the players’ responses. A Gamemaster should always be listening and taking notes, but noting the mood, tone, individual response and banter can prove valuable tools in setting the dials and measuring the pace for the adventure. A tired group of players need more push and adrenalin, while an inquisitive party might still want push, but also deserve the attention to detail they desire. When I ran Save Innsmouth at Dragonmeet, I asked about the relationships of the characters at the start as we generated their stats in session. I had them give me a narrative synopsis of the character before the game and chose Abilities and Advantages using the Classless Cthulhu guidelines. As they settled in and had a look at the Abilities, they started to bounce off each other a bit. I let them choose their gear, so they opted for things like an iPad, digital camera and so forth, as well as camping gear. When the adventure started proper, I asked them what they were doing — and over the next few minutes added a player, got feedback on their mindset and first action, then moved on. This allowed me to get a handle on each player as much as their character. Save opens the possibility of investigating retrospectively. By asking a question about existing knowledge, the characters have the opportunity to roll Flashlight or Smokes to find out something BEFORE the adventure started. Rather than make this an info dump – which it absolutely could be – you can run these as mini-scenes with one or more character involved. I got the feel that the sense of urgency in this group was stronger than the desire for more information – survival mattered more as the situation panned out and the environment became more clearly defined. However, the digital camera and iPad allowed for other opportunities to do flashbacks, as confused characters checked back through their footage looking for things that they might have missed on the outward journey to the start of the adventure. As we progressed through the adventure, I continued to read the players rather like checking the dials and readings as you drive. Speed, temperature, fuel – they’re all relevant to both! As it happens, I could see the players enjoyed the fast pace and didn’t need a break, so we pushed on. It kept the action flowing and the tone of the game fast-paced, while also considering each player and their character. Individuals have their own tells that you need to be attentive to, ensuring you don’t hold the spotlight too long in one place, or giving leave to lead where the players seem receptive and open to it. Save on this occasion ran to just over three hours, at a fair pace. With more background detail and a little physical conflict, that could easily increase to four or five hours. I wrote it for a single session – and my experiences so far have always involved a brief introduction and character generation. 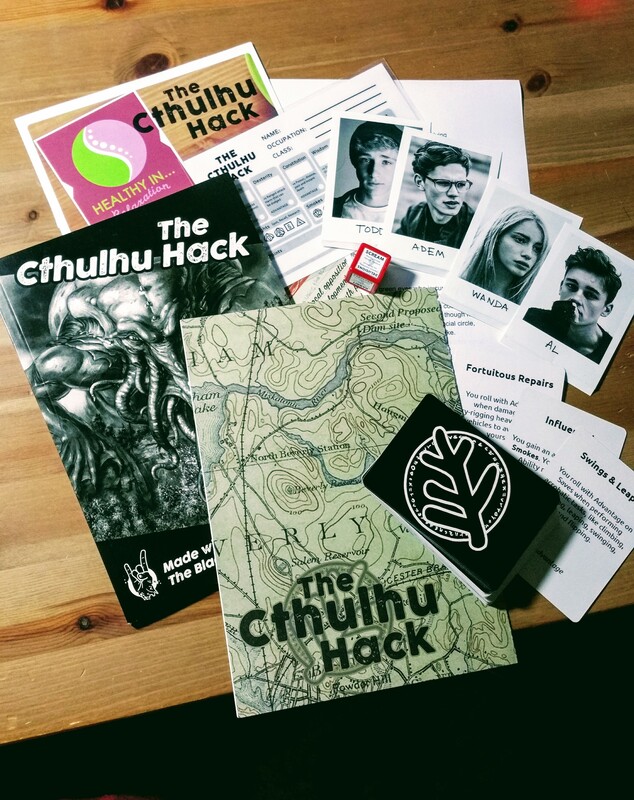 The Cthulhu Hack is quick to start-up and a little pre-session prep can keep their intro short and tight. If you get The Cthulhu Hack Quickstart, it explains the core mechanics in two short A5 pages. If you’re running the game for the first time, it might be useful to have that to hand and tick off the words in bold – I usually highlight key terms that way to make it easier for the GM to spot. I find the feedback I have had from groups that have run it useful – and aim to use those responses to improve the focus and support in future adventures. I aim to release more short adventures in 2017, intended for one or two short sessions or a long one – with room to shorten or expand as the situation allows. I recommend you join The Cthulhu Hack Google+ Community if you have any questions or want to provide feedback.